Usak University Journal of Engineering Sciences (UUJES) aims to publish qualitative peer-reviewed papers within wide scope of principle and/or interdisciplinary engineering branches. The journal also aims to take attention of engineering researchers with good-quality publications. It is expected that serious peer-review process, careful publication process and thus regular publication of qualitative papers result in to be searched in prestigious scientific databases in a short duration. 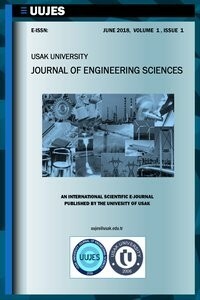 Usak University Journal of Engineering Sciences (UUJES) publishes qualitative papers within wide scope of principle and/or interdisciplinary engineering branches as an international peer-reviewed e-journal. Submissions of theoretical and experimental works are welcomed as original research article, review article, or technical note. Scope includes all engineering branches such as Mechanical, Electrical, Electronics, Computer, Civil, Chemical, Mining, Geological, Material, Textile, Mechatronics, Environmental, Earthquake, Aerospace and etc.